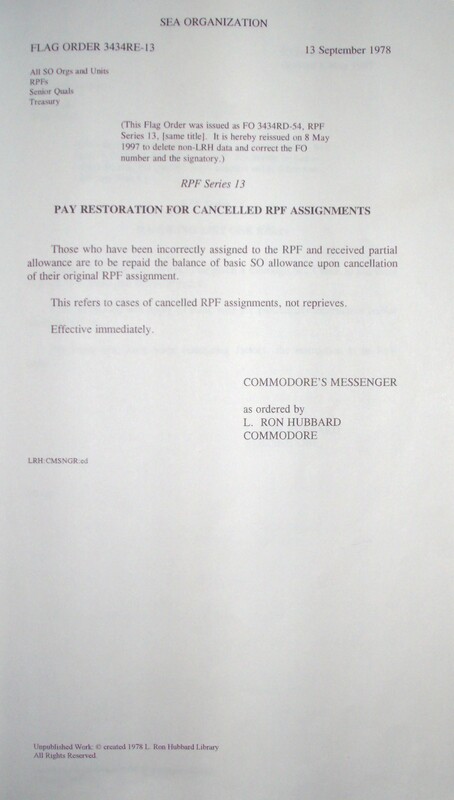 Those who have been incorrectly assigned to the RPF and received partial allowance are to be repaid the balance of basic SO allowance upon cancellation of their original RPF assignment. This refers to cases of cancelled RPF assignments, not reprieves. There can be an omitted step on assignment to the RPF. This was the case in one organization which got up to near 50% on the RPF at one point. Something was wrong. The omitted step was: Have they been destructive on post? If an RPF is building up with high percentages of the crew assigned, it is probably because this one point was not looked into. 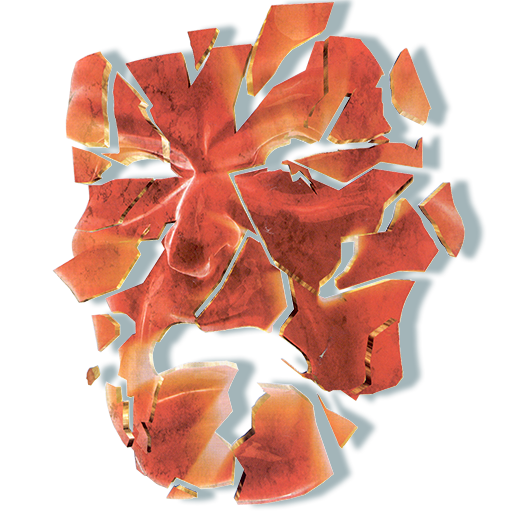 The error is not taking into account the individual’s post stats and destructiveness. 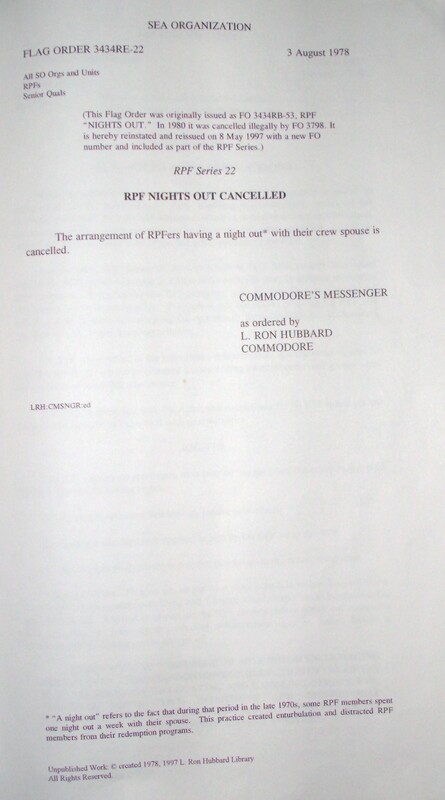 The arrangement of RPFers having a night out* with their crew spouse is cancelled. * “A night out” refers to the fact that during that period in the late 1970s, some RPF members spent one night out a week with their spouse. This practice created enturbulation and distracted RPF members from their redemption programs. Unpublished Work: © created 1978, 1997 L. Ron Hubbard Library. The RPF works segregated—one job, one place, one time, and berths in one area. NO ONE ON THE RPF MAY BE USED FOR ANY POST OR MISSION. 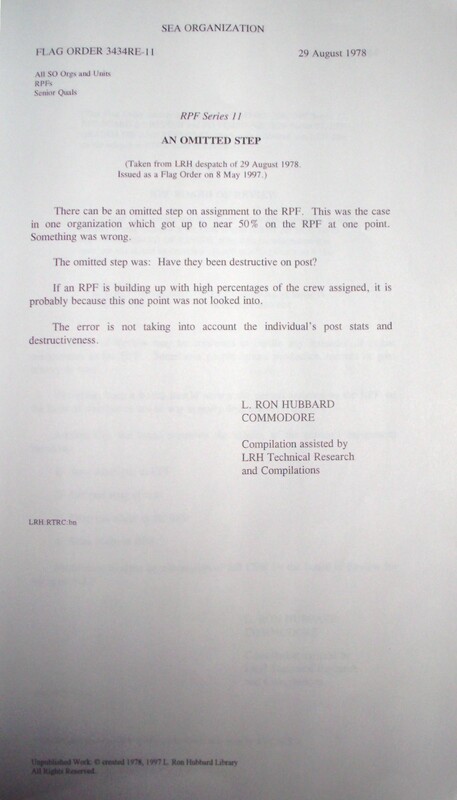 The work that is done by the RPF is assigned by Estates. Wanted is completed Estates projects of good quality, acceptably done by RPF members. All RPF work is broken down into project targets. The CO Estates should list extensively every area in buildings and exterior that needs handling, in exact detail, so as to make the whole area posh and viable and assign them area by area to the RPF, without at the same time letting Estates crew abandon maintenance. 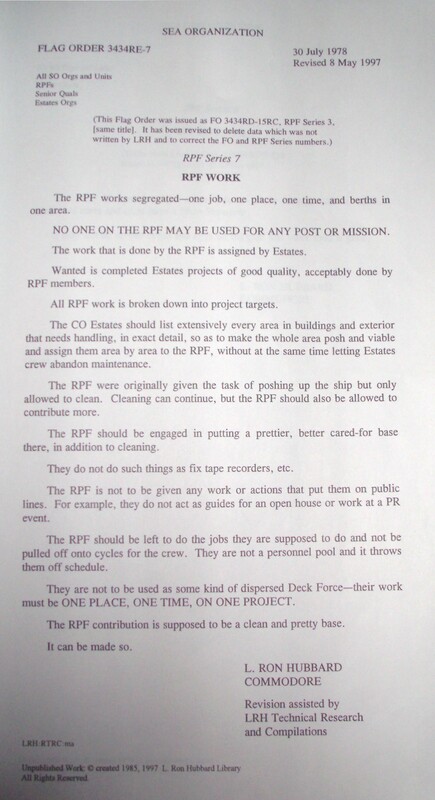 The RPF were originally given the task of poshing up the ship but only allowed to clean. Cleaning can continue, but the RPF should also be allowed to contribute more. The RPF should be engaged in putting a prettier, better cared-for base there, in addition to cleaning. They do not do such things as fix tape recorders, etc. The RPF is not to be given any work or actions that put them on public lines. For example, they do not act as guides for an open house or work at a PR event. The RPF should be left to do the jobs they are supposed to do and not be pulled off onto cycles for the crew. They are not a personnel pool and it throws them off schedule. They are not to be used as some kind of dispersed Deck Force—their work must be ONE PLACE, ONE TIME, ON ONE PROJECT. 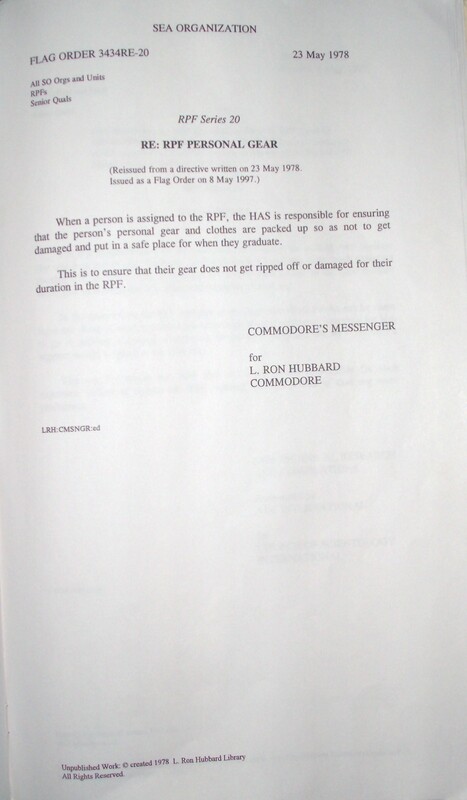 The RPF contribution is supposed to be a clean and pretty base. It can be made so. When a person is assigned to the RPF, the HAS is responsible for ensuring that the person’s personal gear and clothes are packed up so as not to get damaged and put in a safe place for when they graduate. This is to ensure that their gear does not get ripped off or damaged for their duration in the RPF. Unpublished Work: © created 1978 L. Ron Hubbard Library.